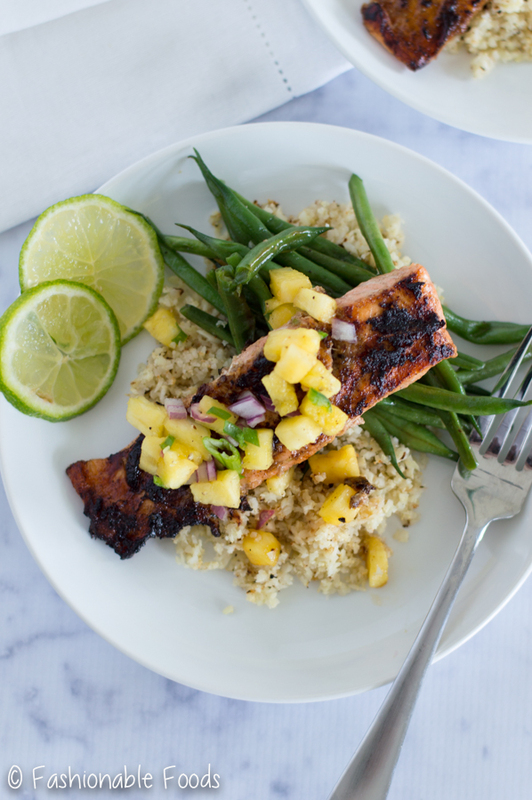 Aromatic spices combine with sweet pineapple in this zesty jerk salmon. 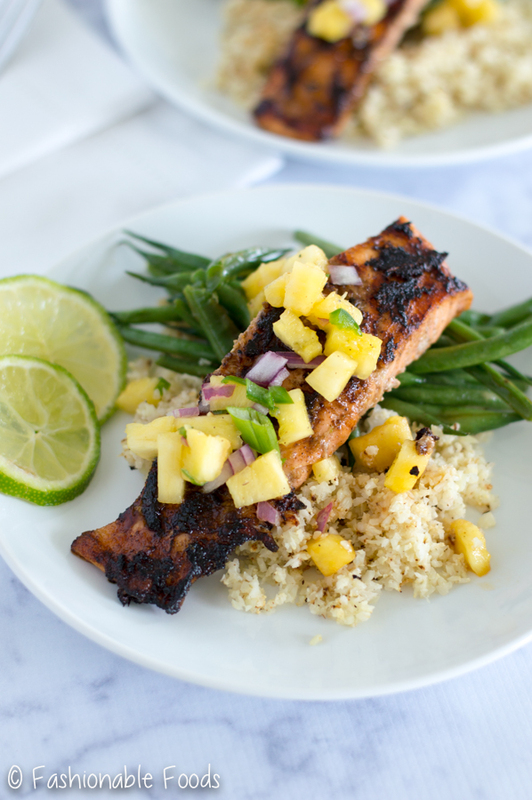 Top it off with pineapple salsa and serve with green beans and cauliflower rice for the perfect light and healthy meal! Happy Tuesday! I hope you all had a nice weekend! Ours consisted of a birthday party (Saturday) and working on our landscaping all day on Sunday. ALL DAY. I was so tired and sore that I went to sleep at 8:30 Sunday night… and slept all the way through the night until 6am the next morning. I can’t remember the last time that happened! It sure felt good, though. Anyway, I’m here today to share with you my new favorite way to eat salmon. <— I totally say that about every single salmon recipe I post, by the way. ? 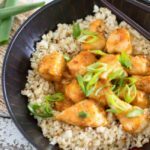 Not only is this a simple recipe, but it’s healthy and full of flavor. The marinade only takes a handful of ingredients, a mini food processor, and a few minutes. 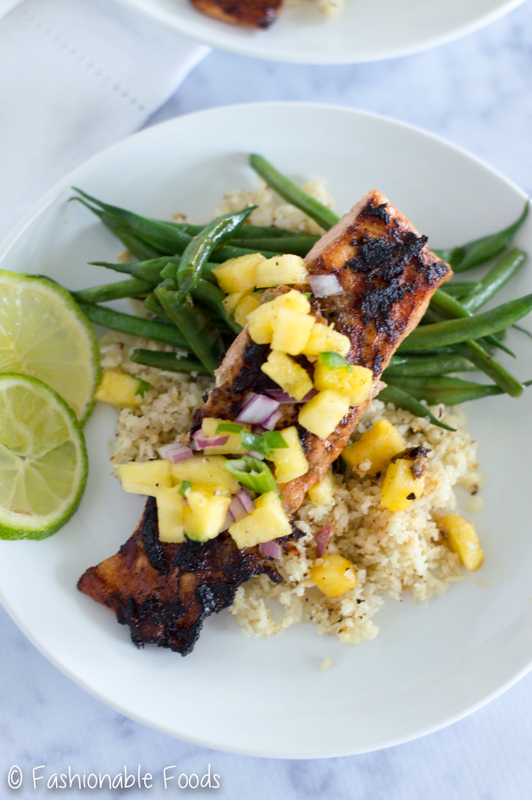 Once you’ve got your marinade all ready, coat the salmon with it and let it sit while you prepare the pineapple salsa. 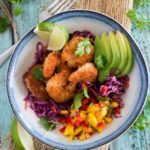 If you’ve been around since the early days of this blog, you’ll remember my fish tacos with pineapple salsa. Don’t mind the old, uninteresting photos by the way. Gotta reshoot those ASAP. ? Anyway, the pineapple salsa from that post is the same one I’m using for this jerk salmon. And it’s SO simple to put together. It’s just pineapple, red onion, jalapeño, cilantro, and lime. 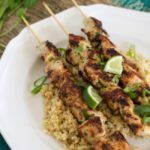 Easy but insanely delicious! Once you’ve got the pineapple salsa made (only takes about 5 minutes! ), you can let it sit for the flavors to marry and then grill (or even broil) the salmon. That only takes a few minutes per side and then you’re good to go! I like to serve this tasty jerk salmon over roasted cauliflower rice and a green veggie. It would also be great over regular rice or even quinoa! 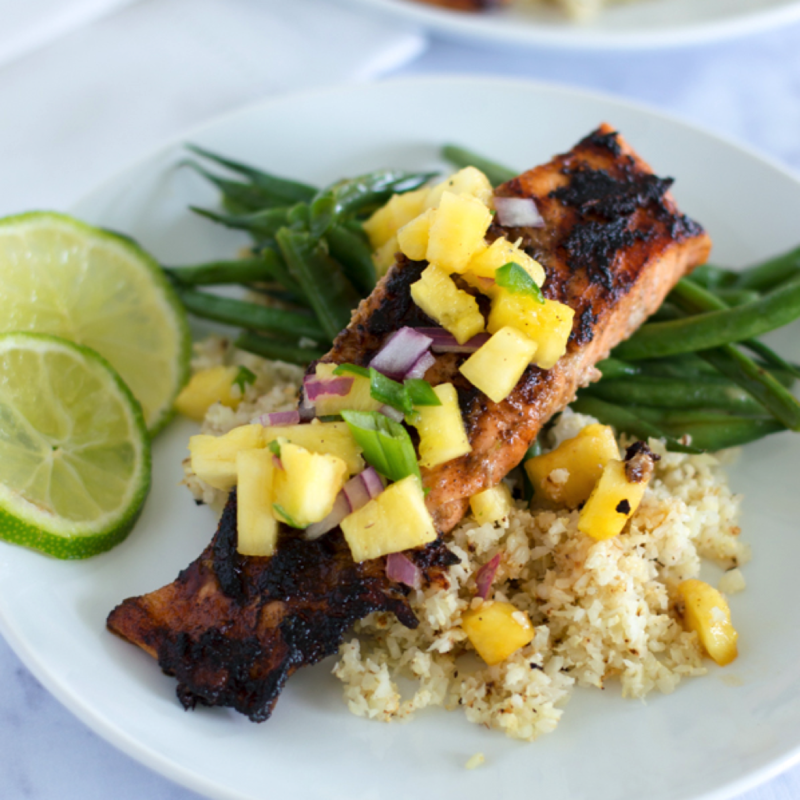 It’s all about the salmon and pineapple salsa anyway, so you don’t want your sides outshining it, right? Combine all the ingredients for the salmon (except for the salmon) in a mini food processor and pulse until mostly smooth. 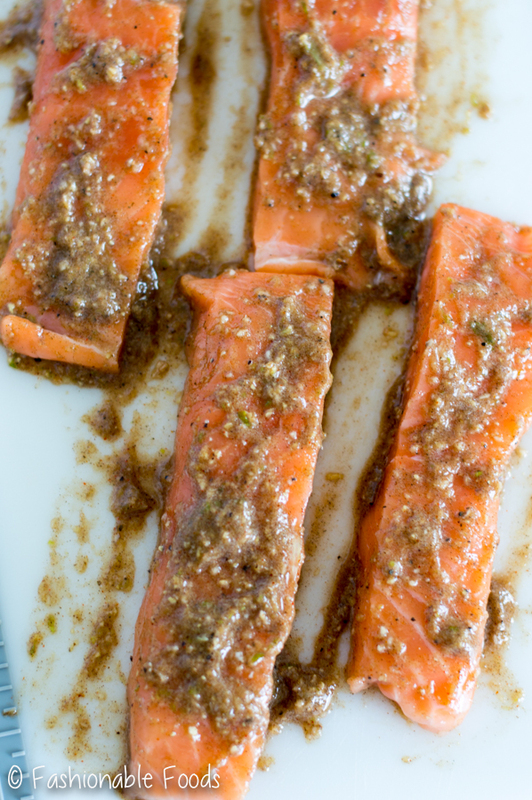 Lay the salmon filets out on a work surface and coat evenly with the marinade. You may have leftover (it’s also good on chicken!). Make the pineapple salsa by combining the pineapple, onion, jalapeno, cilantro, and lime juice in a bowl. Toss to combine and season with salt and pepper to taste. Preheat a grill pan, skillet, or broiler. Cook the salmon on the grill pan for 3-4 minutes per side depending on the thickness and desired doneness. 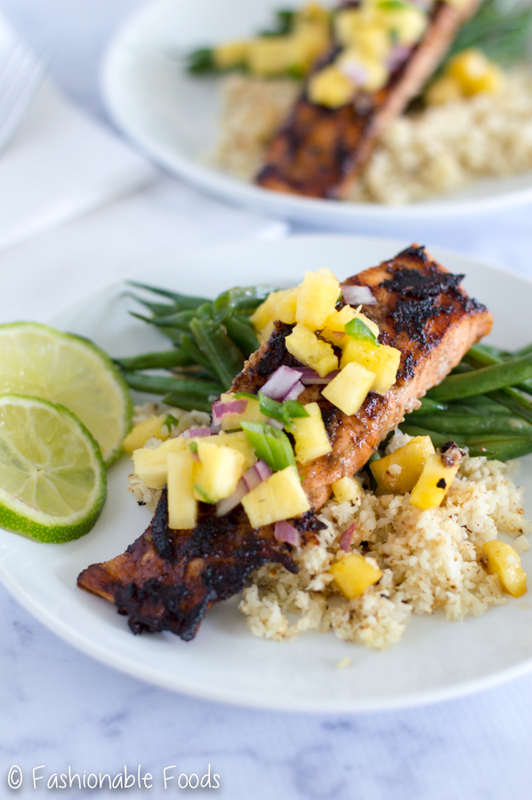 Serve the salmon topped with the pineapple salsa. Sounds like you had a great weekend, Keri! We need to work on our landscaping soon too, that’s our goal for the next few weeks! 🙂 Salmon is my FAVORITE and I make it quite often for my husband and I. I will have to try this jerk version, as I’m loving that flavor and the salsa! It’s so pretty, too! Such a great meal, Keri! Thanks, Gayle! This has definitely become a regular in my rotation! ?